There used to be this 1960’s TV show which you can still find on reruns, the Munsters, about a curious family led by a gentle Frankenstein sort of family head who thumped around somewhat awkwardly in heavy boots. No, it wasn’t Pacers center Roy Hibbert. But Indiana’s somewhat deliberate 7-2 center suddenly has become a center of attention, a monster on the boards and in the lane and certainly for the Bulls as they face the undefeated Indiana Pacers Wednesday night. It’s a plan, and it likely will help determine whether the Bulls can pull themselves out of their early season slump against the league’s only undefeated team. A lot of that with the Pacers is due to their developing star, Paul George, who is second in the league in scoring at 27 per game. But it’s suddenly become a Pacers’ team built around Hibbert’s defensive play as the Pacers are No. 1 in the NBA in fewest points allowed, No. 1 in opponent’s shooting and second to Golden State in point differential. 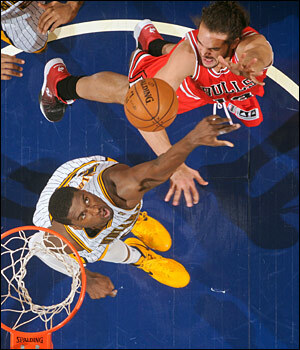 The early season has the Pacers the East’s most dominant team, and much due to Hibbert’s interior defense. Which was a point of discussion as the Bulls had a morning shootaround in Indianapolis. Which may not help Rose’s 29 percent shooting, but you play shot blockers by going into them. And then hopefully getting the call. It seems Rose got a call of another kind. From the NBA. Rose was the latest victim of the NBA’s fashion police, who generally govern standards of uniform dress and undoubtedly have Noah’s private number. Rose said the league informed him he could not wear the tape on his neck he wore previously for a sore neck issue. Not uniform, apparently. It’s hardly unusual as the league studies film of every game to monitor if anyone is wearing anything not conforming with the uniform. At least apparently whether it’s something the league can sell. For the Bulls, it’s Thibodeau selling the team on a serious attitude on playing the Pacers. Of which he should have no trouble as several players were at the arena long before the scheduled morning workout for extra shooting practice. Which comes back to the Bulls’ players playing their roles. “I think just seeing shots fall,” Rose said about changing the team’s early season shooting woes. “We haven’t been in a game where all our shots fell or we shot a good percentage. Just getting that confidence and taking the shots when they present themselves. Similarly with Noah, who has worked his way in after missing much of the preseason.